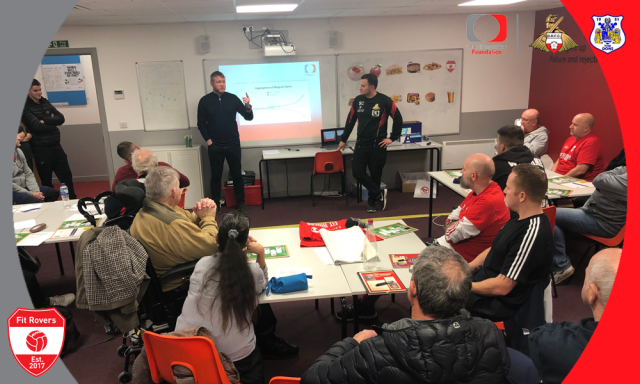 Doncaster Rovers manager Grant McCann took the time to visit Fit Rovers last week, giving some useful advice and guidance around goal setting and motivation to the current Fit Rovers course. The Rovers boss was present during the Fit Rovers vets circuit session, talking to participants whilst witnessing more than 60 men complete the hour-long fitness session. McCann then gave a question and answer session to the current Fit Rovers course, focussing on motivation and goal setting. Using his experience in the footballing industry, participants were able to apply what the former Premier League midfielder said about setting goals and how to apply it to their lifestyle. Participants were then given the chance to quiz McCann on how he motivates his players and monitors their progression throughout the season. McCann visited the footballing session on offer to the vets from 8pm-9pm every Thursday, having been left thoroughly impressed by the success of the entire programme. Doncaster Rovers already have a strong connection with Fit Rovers, with Andy Butler and Matty Blair having established good relationships with the participants and staff members, with the latter the current Fit Rovers ambassador. McCann is just the latest high-profile name to speak highly of the men’s fitness course. Fit Rovers is Club Doncaster Foundation’s pioneering adult fitness course based at the Keepmoat Stadium, aimed at men over the age of 30, free of charge. The follow on veteran sessions are available at just £3 and offer football sessions, boxing sessions and circuit training at the Keepmoat Stadium and various cycle routes around Doncaster. For more information about the next free courses available, contact the team on 01302 764663 / fitrovers@clubdoncasterfoundation.co.uk.